September 28, 2010 // Franchising.com // AUSTIN, TX – Schlotzsky’s, home of The Original® round toasted sandwich and famous Fresh-from-Scratch® buns, took a giant step in their overseas development with a 40 store agreement in Egypt, a move that will nearly quadruple their current international presence in years to come. Food & Entertainment, a Middle East developer representing 11 brands including sister companies Carvel, Cinnabon and Seattle’s Best Coffee, plan to open the first location in Egypt in the first half of 2011. Schlotzsky’s parent company FOCUS Brands Inc. ®, the franchisor and operator of 2,200 Carvel®, Cinnabon®, Schlotzsky’s®, Moe’s Southwest Grill® locations and Seattle’s Best Coffee® in international markets, has a robust international infrastructure that currently supports over 530 locations in 34 countries, and is poised to support significant international growth for Schlotzsky’s. Schlotzsky’s international development has seen a huge boost in the recent year, and expects to open 7 to 9 additional international locations by the end of 2010 in Kuwait, Saudi Arabia and Turkey. Currently, Schlotzsky’s has 17 international locations. Schlotzsky’s domestic development has seen an influx in the recent year and is set to support 50+ openings in 2010. Schlotzsky’s attributes the surge to a recent brand reinvention, in which they unveiled a new prototype restaurant featuring vibrant colors, playful slogans, contemporary furniture and artwork, and a partnership with sister company Cinnabon that offers franchisees two brands under one roof. Schlotzsky’s also introduced a new service model where crew members hand-deliver food to the tables. September 2010 – Jim Villemaire says he got a lucky break. The former Bennigan’s cook was making copies at the parent company’s corporate headquarters when S&A’s head of research and development invited him to come work for him. At the time, Villemaire was a training at Bennigan’s and had no R&D experience. While working at Bennigan’s, he also met his future wife – which he ranks as one of his career highlights. He then took a job at a giant supplier Cargill, where he continued to learn about R&D in the restaurant business. Now, as director of R&D for the 39-year-old, 350-unit Schlotzsky’s, Villemaire incorporate lessons learned while working at restaurants and Cargill – a job that allowed him to gain insight into many large restaurant companies. In addition so sharing some of his best practices, Villemaire reveals news on yet-to-be-released menu items. What was your first foodservice job? I was a cook at Cheddar’s in Arlington, Texas. How did you transition from cooking into research and development? I worked my way through the cooking ranks at Bennigan’s and got into kitchen management and was tapped to be a trainer. One day I was standing by the copier and them man who took over for director of R&D at S&A restaurants [Bennigan’s parent company] at the time, David Groll, said he had a team of chefs, but didn’t have anyone who had any experience working [in the kitchen] at Bennigan’s. He asked, “Do you have any interest in doing research and development?” I jumped at the chance. He gave me the opportunity of a lifetime. After S&A, you took a job with supplier Cargill. Did your experience there give you insights into how other chains operate their R&D departments? I got to see the best practices of some amazing chains. I took the best pieces of how they do things. One of the most important things I’ve integrated is that I want anyone who does anything for me to feel appreciated. People who sit on my side of the desk can get aggressive and feel so important. But we’re all just people. Was it difficult to make the switch from supplier back to a chain? For a while I feared that I’d never be able to get back [into a restaurant company.] Once I left, [some people] didn’t consider me a real restaurant chef. You learn about how people like to categorize. Some of the sales folks who used to be your best buddies didn’t have any time for you when you didn’t anything to give them. And that in itself was eye opening. Describe Schlotzsky’s for anyone who’s never been to one. What are they most known for? They are all sit down. Probably 65-percent have drive-thru. It’s a fast-casual type set up. Really the entire heartbeat of our brand is the bread. It is that homemade quality. We had a lot of people come through and say we could grow faster if we use a pre-made bread. But we haven’t found anything that meets our benchmark. Are you planning to add more healthful dishes? We’re exploring all of our options there. But it’s not the over-arching focus. I was told to work on healthy items, and I was working with a lot of panels of females, and one of the items they all loved best was the chicken sandwich with a fat-free spicy ranch dressing, jalapeno cheese sourdough bun, alfalfa sprouts, shaved chicken breast, lettuce, tomato, a little bit of onion and guacamole. But at the end of each session, they said you should add bacon and cheese to it. It is now served with the bacon and cheese as the California Chick promotion. I understand. At home, I eat healthfully. When I go to a restaurant, I am going to get something that really floats my boat. I’m trying to drive sales, and something that is indulgent and decadent is what moves people. We have become increasingly aware of people’s allergies and diets. To reduce sodium content is a major goal for us. We’re always looking for ways to try to address things like gluten. But so much of the [health talk] is buzzwords that are usually wielded by people who have very little connection to the foodservice world. They’re usually politicians. So if healthful food isn’t Schlotzsky’s major focus right now, what is the company’s priority? We’re trying to grow with strategic partners in some of the areas where we’re already present, to flush out these markets and take them from open markets to closed markets. What are the big food trends that you’re watching right now? We’re seeing fresh and local. Organic. We’re seeing people expect more ethnic authenticity – Thai, Mediterranean, Greek, Korean and Southwestern. How does your guest define value? The guest doesn’t always define value in how much something costs. They define value in terms of what they get. They are willing to spend money if they feel they’re getting good value. An example I can give you is for years we have been testing steak sandwiches and salads. I’d try to engineer both of them based on what our current prices are, but I wasn’t hitting the mark. Finally, we decided that we were going to sell the best steak. We went out and found a slice Angus rib-eye steak. And we put it out there for $6.99 and $7.99 a piece, and [those items] came back with better value ratings than when we were testing it at $4.99. When might we see that promotion? The steak sandwiches are going to be a holiday focus this year. How do you cook the steak? The product comes in already seasoned, sliced and cooked, and we heat it in a conveyor oven. What do you add to it? We have several varieties. We’re still working on which ones will be the finalists. But one [that might be available] is the Steak and Bacon Smokecheezy with smoked cheddar. It has roasted red bell peppers, crisp bacon and a touch of lightly spicy chipotle mayo. One of the others is served on a jalapeno cheese bun. It has pepper jack cheese, lettuce, tomato, onion, guacamole and chipotle pesto. We’ll be doing there. The other one we’re still toying with. Carvel to Give Away FREE Ice Cream September 23rd! AUSTIN, TEXAS – Schlotzsky’s-Carvel cobrand locations are celebrating you – our wonderful fans – with FREE ice cream September 23rd! Come celebrate fall with a Junior cup or cone of our delicious soft-serve ice cream at no charge. Consider it a scoop of thanks for your year-round support! *Free Junior cup or cone is 3 oz. size. Not valid with any other offer. 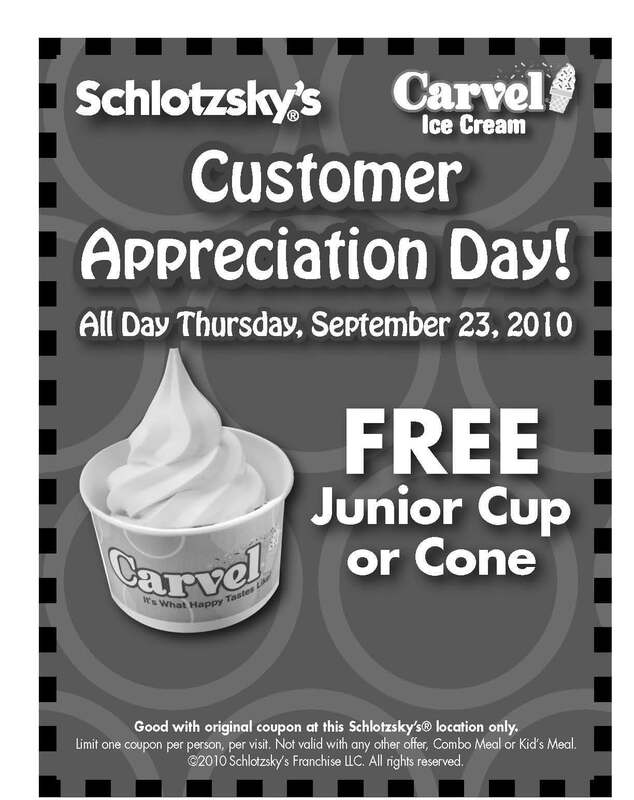 Offer good only on September 23, 2010 at participating Schlotzsky’s-Carvel cobrand locations. September 21, 2010 – Kelly Roddy was named president of Schlotzsky’s in December of 2007, the same month the “great recession” began. Since taking the helm of the sandwich chain, Roddy has led the company to strong financial results through strategic changes and strong marketing. Prior to Schlotzsky’s, Roddy was with H-E-B Grocery Company, a 102-year old retailer with more than 300 locations throughout Texas and Mexico. Roddy also worked in business development for Scholastic Corporation, the national book publisher and he also spent eight years with Wal-Mart stores. He currently serves on several boards including Baylor University’s Marketing board, Hankamer School of Business board and the Caritas board. You joined Schlotzsky’s in December of 2007, just as the “great recession” started. How did you deal with the poor economic conditions as you tried to move the concept forward? We made the decision to Zig when everyone else Zagged. At that time, many companies were setting up a defensive position, trying to brace themselves for the recession. We have charged full speed ahead on a major brand reinvention. We worked on our company culture, strengthened our business model with the advent of Cinnabon Express, we launched a new brand position, “Lotz Better”, and redesigned all of our packaging and launched more aggressive marketing. We also developed a new prototype and we put in place a very aggressive development plan to grow the company. Instead of focusing on the poor economy, we focused on what we could do to provide more value to our guests by moving to a table delivery model. We have done all of this and had positive comps for 2007 through 2010 so far. Some have said to me that I should walk before I run. I say to them, see you in the rearview mirror. What have been the biggest challenges that you have faced during your time with the brand? We have been in a constant state of change since 2007. Change is difficult for some but we have made it part of our culture. Everyone now understands that if we are not in a constant state of evolution then we will become extinct. Read more. September 14, 2010 – Schlotzsky’s has signed an agreement with a local franchisee to open six new restaurants in the Houston market. Franchisee Terry Lassinger is planning to break ground on the first restaurant in Montgomery County next year. The new restaurants are being built with Schlotzsky’s rebranding efforts in mind, including a new design, a co-branding deal with Cinnabon and a new service model where workers deliver food to the tables rather than have customers pick it up themselves. Lassinger is among several multi-unit deals recently signed by Schlotzsky’s since introducing its new prototype. The Austin-born sandwich chain plans to have between 600 and 700 locations by 2015. It currently has more than 350 locations worldwide including locations in Turkey, China, Saudi Arabia, South Africa, Costa Rica, Jordan and Kuwait. The chain plans to aggressively target markets in Texas as well as untapped markets across the country such as Kansas City, St. Louis, Raleigh, Charlotte, Atlanta and Florida for more multi-unit developers. September 08, 2010 // Franchising.com // Carrollton, TX – Schlotzsky’s, home of The Original® round toasted sandwich and famous Fresh-from-Scratch® buns, will open its newest “Lotz Better” location at 3328 East Hebron Parkway in Carrollton on September 17, adding nearly 25 jobs to the local economy and bringing smiles to diners with its quirky brand personality. “With our addictive recipes, upbeat surroundings and funny sayings, we’re adding tremendous flavor to the Carrollton quick-casual dining scene,” said Cary Albert, owner of the new Carrollton Schlotzsky’s location. “It’s hard not to smile when you walk into our bright new restaurants, smell the dough baking and see how much fun we have with ‘bun humor.’ Carrollton is in for a real treat.” Read more. September 1, 2010 – Schlotzsky’s Deli rolled out three new chicken sandwiches this week, continuing the 300-plus unit chain’s Route 66 menu campaign featuring menu items named for cities along the iconic American highway. The new Santa Fe Chick sandwich features thinly sliced, roasted chicken breast, cheddar cheese, fat-free spicy ranch dressing, green chiles, lettuce, green onion and tomato on toasted jalapeño cheese bread. It comes in small and medium sizes priced about $4.99 and $5.99, respectively. Prices of the signature round sandwiches vary by location. The same thinly sliced roasted chicken breast is teamed with fennel-artichoke pesto, provolone cheese and baby spinach on toasted sourdough bread for the Sedona Chick sandwich. It has a suggested price of $5.99 for the small and $6.99 for the medium. Lastly, the California Chick highlights guacamole, alfalfa sprouts, pepper jack cheese, bacon, red onion, tomatoes, lettuce, fat-free spicy ranch dressing, thin-sliced roasted chicken breast and toasted jalapeño cheese bread. It sells for $5.99 to $6.99 for small and medium portions, respectively. Read more.